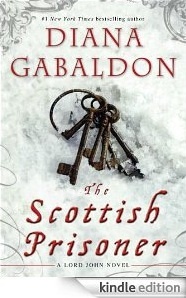 My OUTLANDER Purgatory: The Scottish Prisoner, Y'all!!!! LOL! I had no idea you didn't know about that, or I would have said something long before now. You need to check out my blog on a more frequent basis, I think. :-) I've had a SCOTTISH PRISONER FAQ, countdown, etc., on my site for a few weeks already. B&N has the pre-order up for the hardcover and e-book as well. I saw it a couple of weeks ago. The description has it at 544 pages. You guys are getting me all excited *jumps up and down* the question I have is am I able to read this book individually without reading the other Lord John books or must I? Cause I read one "Lord John and the Hellfire Club" I believe and it seems like everything has it's own storyline yet things are loosely tied together. Mariam - yes, Diana says you can read this book without having read the other LJ books. It's told half from Jamie's point of view, half from Lord John's, so there will be a lot in it to appeal to readers who haven't read the LJ books. Looking forward to it very much! Amy - according to the Recorded Books web site, the answer to that is YES. No word yet on audible.com, but it may be a little too early for them. Yes, I canna wait!! But we neeeeeed to fill our time in some way until DG's books are released.......like how 'bout an "Into the Wilderness" Purgatory blog?????? I just started this book yesterday. It is bloody fantastic. Right from the first page. I looooooooove it!! Come on, Carol!! I have the DT's. Jennifer, I couldn't agree more!! I just finished reading all 6 of the Wilderness books and I'm dying to talk to someone about them. A Wilderness Purgatory would be awesome! Can you stand that? "My favorite kind of book is the sort you live in, rather than read." Oh. My. Word. It sucked me instantly. Looooving it!! Are these books enormous too? On Amazon it says over 900pages. That's one of the problems with ereaders...........not having a clue exactly how BIG a book you are reading! Nikki, I am peeing in my pantalones at your question right now. Sooo...I have not pre-ordered...but I had kindof made up my mind that it wouldn't hurt as this is a Kindle edition...and doesn't have to be delivered. Y'all, I emailed and asked Shannon about Into the Wilderness and am still waiting for a reply. She read most if not all of them. I've never heard anyone say it's bloody fantastic! That's quite a glowing review!!! Shura-loving Shannon? She rocks. We wouldn't steer ya wrong. And there are 5 more in the series???? Uh, I'm soooooooooo glad!! I'm going to start Into the Wilderness tonight - I canna ignore the raves any longer! I know that Hildy is reading the 6th book now, and she is the one who finally convinced me to pick them up. I can understand why Hildy is reading the series. I see Bronze Horseman-ish/Outlander-ish issues. Yes girls I read the entire series and did love it all the way to the end. I agree with Diana in that you tend to live the book rather than read it. Ps. This Shura loving Shannon had a Hot thing for Nathaniel too! So glad to hear that you loved the WHOLE series. What a relief! I prefer to be called Hot-4-Nat!!! Pick me!!! LOL. Cari, I'm thinking of picking up Book 1 again to read with you. I'd love to go back to the beginning to where it all started!!! I canna believe you kept this series from me!! *sniff, sniff* After all we shared with TBH.........lol!! I would love to message you. I have many questions (and a sudden fondness for waterfalls), but I have no idea how to send you a message. Sorry, I'm slow. OR, perhaps SOMEONE will start a BLOG about this series. Hmmmmmm? I feel SICK just hearing you say that you only have 50 pages left!! Uhhhhhhhhhhhhhgggggggggg. The pain! Jennifer J!!! I didn't know! I swear!! I was just quietly reading these books, having little freak-outs cause I couldn't share my thoughts with anyone. I've been seriously pestering Cari about starting them. The thing is, I didn't have high expectations for them. I didn't know much about them so they took me by surprise. That's a good feeling. I loved the journey. I just finished the book and have lots to say but I can't say anything cause I don't want to spoil the journey. Jennifer J, I'm trying to figure out the messaging. Anybody? I clicked on some photos along the right and it said "Send message" underneath. I think that's what you do. I couldn't figure out how to send one to you. Ok, you are forgiven!! You may now consider yourself "Hot-4 Nat"!! I just read for 15 minutes with my hand over my mouth! My heart is just racing..............holy cow! I read The Help. It's a nice read. I just felt like I wanted "more" description. I didn't feel truly involved in the story. I think it's an incredible story.....but I'm betting the movie is going to be even better. Has anybody seen it? You _could_ always just stick a bookmark in The Help.........and return to it later. It'll wait. yes, of COURSE I'm on Goodreads! I changed my profile account here. Click on my name. I'm on page 84, but I swear I've been HOOKED by about page 2. Seriously. I KNOW!! This book is 12-step good!! Cari, thank you for giving me credit for annoying you so much that you finally are reading the book. I'm also glad you're loving it. I swear, I'm stalking you and Jennifer J. right now. I'm just so excited for your updates. Holy cow. Now I'm getting excited to read this book. Here's my problem: I need HELP getting through THE HELP. Seriously. It's just so hard to read. I get so upset. It's good - but the subject matter bums me out and then I make excuses to do other things instead of read. I'm not sure that I have advice. The Help was a good book, but it upset me too. I remember putting it down a lot. I liked it, I just didn't love it. It took me FA-Ever to read The Help!!! Seriously. Like 3 or 4 weeks! I've been reading Into the Wilderness for 4 days? and I'm 85%ish of the way through!! Read the first chapter. If you can put it down, I'll..........well, I don't know what I'll do.......I can't think. I must go read. God I never expected all this ITW goodness! I am about 25% through The Help but it's getting better - so I'm more likely to read it. Then I swear - I will read ITW and hopefully blog. And JJ - girllll you are adorable - but don't you be buyin' me any kindle books now, ya hear? (That's my "Help" speak). I promise I'll read it. :) Let's see if we can get Tracey on board, too.